Links To Cat Sites WE recommend. The Ultimate Cat Behavior Guide. Zoonosis is the term applied to a disease that can be passed from animals to people and vice versa. Most feline zoonotic diseases are rare but many myths seem to exist regarding disease risk. In reality, more people become ill from food borne disease rather than contact with cats. Practising common sense together with a good hygiene routine, including careful handling of litter trays, washing hands after contact with cats and before eating and routine treatment of cats for fleas and worms, significantly reduces the possibility of disease transmission from cats to humans. 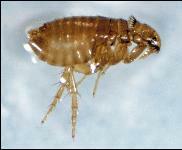 Cat fleas cannot actually live on humans but can bite humans and cause skin irritation. Cats should be regularly treated with a suitable product eg Frontline spot on every 5 weeks. Your house can be sprayed with Indorex spray – one application will last 12 months. Ringworm (dermatophytosis) is a skin condition that can be passed to humans from cats. Affected cats may have circular areas of hair loss especially around the head with crusting of the skin. Ringworm is due to a fungal infection, not a worm. In people it is characterised by a red ring with a crusting edge, generally on the skin of the fingers, arm or face but it can affect anywhere on the body. Your vet can test your cat for ringworm and instigate appropriate treatment. It is important to remember that fungal spores can persist in the environment for a long time (18 months +) Thorough disinfection of surfaces your cat has contacted needs to be undertaken with a suitable product eg 10% bleach solution. Vacuuming the area prior to cleaning is a must and most areas need cleaning 3 times before decontamination is achieved. You should use gloves to handle infected cats. Toxoplasma is a parasite found in uncooked meat, unwashed vegetables and cat faeces. Infection in people causes mainly flu like symptoms but rarely causes problems for people with a fully functioning immune system. If infection occurs in pregnant women, the developing foetus can be damaged. it is recommended that litter trays should always be emptied and disinfected on a daily basis (the eggs don't become infectious for humans until more than 24 hours after they are shed in the faeces) and that pregnant women either wear gloves to do this or get someone else to clean the litter tray. Meat should be cooked thoroughly and vegetables washed before eating. On rare occasions, humans can become infected with the cat roundworm (Toxocara cati) or the tapeworm (Dipylidium caninum). These infections are very uncommon (canine roundworm infections are more common in people), but regular worming of cats for roundworms and tapeworms is important. Use either Drontal (tablet) or Profender (spot on). These intestinal bacteria can be a cause of severe gastrointestinal disturbances in many animals. Infection in human is usually from contaminated foodstuffs however, hygienic precautions eg regular hand washing after handling a cat should be employed, especially when handling cats with diarrhoea. If campylobacter or salmonella are identified in a cat with diarrhoea, your vet will want to carry out specific treatment and monitoring. Cat scratch disease is an uncommon disease caused by the organism Bartonella henselae commonly found in cats. Transmission between cats occurs mainly by fleas but transmission to humans via bites and scratches is very inefficient. Signs of disease in humans include swollen lymph nodes, fatigue, muscle pain and sore throats. Serious illness is very rare. Allergies manifest themselves in different ways. Some people are mildly affected, feel itchy, snuffly or sneezy; others have skin reactions and a few experience serious asthma attacks. During an allergic reaction a person’s immune system reacts to foreign proteins with the release of chemicals to defend itself. Histamine is one of these chemicals which can irritate the lungs, nose and skin leading to sneezing, wheezing and itching. The protein secreted in cat saliva and skin (not fur or dander) is the main trigger for allergic reactions to cats. The protein is transferred to the coat when a cat cleans itself and is also shed in urine and faeces. All breeds of cat produce allergens, long haired seem to cause people to react more but even breeds with little hair like Rex and Sphynx cats may still cause reaction. ALLERCA has produced the world's first scientifically-proven hypoallergenic cats – these cats are genetically modified to remove the gene that produces the protein that people are allergic to. The current cost of these kittens is $ 3950 in the USA, $6950 to transport to UK. If you are mildly allergic to your cat, keep it out of your bedroom and off the bed and keep the house (carpets, curtains and cushions) well cleaned - a build-up of allergens can trigger reactions. Wooden or tiled floors with washable rugs are also much more cleanable than wall-to-wall carpets. Vacuuming can stir up allergens. Some products claim to reduce allergy when applied to a cats coat – these are in general unproven. Antihistamines may help an allergy sufferer and immunotherapy (process of injecting gradually increasing weekly doses of cat allergen into the skin) can help some individuals with symptoms reducing significantly after 6 months. It is important to understand your cats thinking processes and we guarantee that by reading our Kindle E-Book you will have a head start. The most important factor in having a wonderful long term relationship with your cat is learning how they think. Get inside your cats head! Click the button below to get more information at a low price and start helping your cat and yourself! You can order by the credit card of your choice on Amazon and start the download immediately.